Tyler Gaffney powers through the Oregon State defense. Gaffney had 145 yards rushing and 3 TD in the game. When you think of Pac-12 football, you don’t normally think of defensive struggles. When the 6th ranked Stanford Cardinal visited the 25th ranked Oregon State Beavers, the expectation was that the team that had the ball last had a chance to win. That was the case, but not in the way most people expected. Both defenses played really well and the officials let the two teams play without many whistles. The result was a physical, hard fought contest with much less scoring that normal. Both teams came into the game with 6-1 records. The two teams were tied for second in the Pac-12 North behind undefeated Oregon. Oregon State had won 6 in a row after losing to FCS team, Eastern Washington in week one. Since losing to Eastern Washington, Oregon State has averaged over 43 points per game. Their offense revolves around junior quarterback Sean Mannion and junior receiver Brandin Cooks. Mannion is a Heisman candidate, leading the country in passing yards and touchdowns. Cooks leads the country in receptions, yards and touchdowns. The two have a great chemistry and so far have been tough to contain. Stanford on the other hand, loves to pound the ball right down the throat of the defense. They use their offensive line and running game to control the clock and then lean on their outstanding defense to put pressure on the opponent. Stanford had the first chance at cracking the scoreboard on their second possession of the game. The Cardinal drove to the Oregon State 17 yard line, however, Stanford coach David Shaw decided to put in his running quarterback. Sophomore Dallas Lee coughed up the ball and junior defensive end Scott Crichton scooped it up and returned it 36 yards to the Cardinal 42 yard line. The Beavers were unable to capitalize after Mannion was sacked by Stanford defensive end Ben Gardner and later by linebacker Trent Murphy. They ended up having to punt on 4th and 31. Late in the 1st quarter, Cooks gave his team a lift by returning a Stanford punt 41 yards to the Cardinal 39 yard line. The Stanford defense stood tall and limited the damage, holding Oregon State to a 50 yard field goal. The Beaver defense held Stanford on their next possession and they had a chance to increase their lead. Mannion drove his team to the Cardinal 18 yard line, but on 4th and 3 Mannion’s pass to Kevin Cummings fell incomplete and Stanford took over on downs. The Beavers held Stanford and on their next drive they were again faced with a 4th and 1 situation. Coach Mike Riley again decided to go for the 1st down and again the Stanford defense held. The two consecutive stops on 4th down seemed to ignite the Cardinal and they got their first score right before the half. A 37 yard completion from junior quarterback Kevin Hogan to junior receiver Ty Montgomery put Stanford in scoring position. Two plays later Hogan scrambled for a 23 yard gain to the Beaver 4 yard line. From there, senior running back Tyler Gaffney punched it into the end zone to give Stanford a 7-3 lead going into halftime. Stanford seized the momentum on the first series of the 3rd quarter. Oregon State receiver Victor Bolden fumbled the halftime kickoff and it was recovered by Stanford linebacker Joe Hemschoot at the Beaver 12 yard line. It only took two runs by Gaffney to get into the end zone. The extra point sailed wide, so the Cardinal lead was 13-3. On Oregon State’s next possession they went for their third straight 4th down conversion and once again turned the ball over on downs. After turning the ball over, the Beaver defense stood tough and forced a 3 and out for Stanford. This time Oregon State was able to get a score. Mannion drove his team 90 yards in 12 plays and they got the TD on an 8 yard pass to Brandin Cooks. Stanford linebacker Trent Murphy blocked the extra point and the Cardinal held on to a 4 point lead at 13-9 going into the final quarter. On Stanford’s first possession of the 4th quarter, they extended their lead to 20-9 on a 32 yard run by Gaffney. It was Gaffney’s third rushing TD of the day. After exchanging punts, the Beavers got the ball back with 6:15 left. Mannion’s pass to Richard Mullaney was incomplete on 3rd down. Strangely, Riley decided this time to punt the ball. The strategy worked though, as two plays later Gaffney fumbled the ball at his 23 and Beaver defensive end Dylan Wynn recovered at the Cardinal 20 yard line. The Cardinal defense stood tall and held Oregon State short of a 1st down. Needing, two scores, the Beavers opted for the 39 yard field goal to cut the lead to 20-12 with 3:00 left. The Beavers used their timeouts and forced a 3 and out. The Cardinal punted the ball back to Oregon State with 1:43 left. Mannion drove his team to the Stanford 7 yard line, but the Cardinal defense stiffened and forced four straight incomplete passes to seal the win. 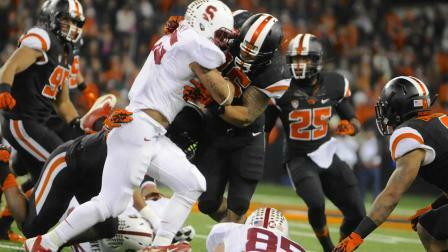 The Stanford defense played lights out all game long, putting pressure on the Beaver offense. They held Mannion under 350 passing yards and sacked him 8 times. The Cardinal offense did not play very well, especially in the passing game. They will need to play much better in their next game against the Oregon Ducks. The Stanford win pushed them from #6 in the BCS rankings to #5. They will have an off week before hosting the #2 ranked Ducks with the winner likely winning the Pac-12 North. With the loss, Oregon State fell out of the top 25 BCS rankings. They will have to recover quickly, because they will host a Friday night game against the USC Trojans. The Trojans started the year slowly, but have recovered after the firing of Coach Lane Kiffin. They have a 2-2 conference record and are tied for second place in the Pac-12 South with Arizona. Kevin Hogan, QB, RS Soph: Struggled against an aggressive defense. Great off play action and excels on bootlegs. Eludes the rush well and does a good job improvising. Takes care of the ball. Has only one loss since taking over as the starter. Completed 8/18 for 88 yards. Had a big 23 yard run right before the half to set up the first touchdown. Tyler Gaffney, RB, Sr: Former minor league baseball player in the Pittsburgh Pirates organization. Key to the Cardinal offense in this game. Great feet. Finds creases. Good stiff arm. Great second effort. Has enough speed to get to the edge. Keeps feet moving after contact and gets yardage after contact. Good in traffic. Has the leg strength to drag tacklers. Had 22 carries for 145 yards and 3 TD’s, one of which was 32 yards. Kelsey Young, RB/WR, Jr: Lines up all over. Effective on reverses and fly sweeps. Had 2 carries for 23 yards. Ty Montgomery, WR, Jr: Had a disappointing sophomore season, missing 3 games and hampered by a sore knee. Has become the go-to guy in the Stanford passing attack. Good speed. Runs crisp routes. Does a good job coming back to the ball. Had 3 catches for 55 yards and had a 37 yard catch. Had one dropped pass. David Yankey, G/T, Sr: Athletic. Has played both guard and tackle. Likely a good fit as a guard or right tackle at the next level. Good mobility. Good strength. Able to handle the bull rush. Good on seal blocks and traps. Key to the inside running game. David Parry, NT, Jr: Does a great job of tying up blockers which allows the linebackers to flow to the ball. Had 3 tackles and ½ tackle for loss. Ben Gardner, DE, Sr: Back to back All-Pac 12. Moves all around. Able to move inside and rush the passer on 3rd down. Gets off of blocks well. Gets after the passer. Injured his shoulder in the 3rd quarter. Had 3 tackles, 1 tackle for loss and 1 sack. Josh Mauro, DE, Sr: Good pass rusher. Can move inside on 3rd down and rush the passer. Good motor. Had 8 tackles, 3 tackles for loss, 1 sack and 1 forced fumble. Had a big 4th down stop just before halftime. Called for offside penalty. Kevin Anderson, OLB, Jr: Tackles well in space. Disruptive. Had 5 tackles, 2 ½ tackles for loss and 1 ½ sacks. Blake Leuders, OLB, Sr: Doesn’t give up on a play. Had 2 tackles, 1 ½ tackles for loss and 1 sack. Trent Murphy, OLB, Sr: Had a great game. Active and disruptive. Gives relentless effort. Good instincts. Gets into the passing lanes. Good flexibility and forward lean on pass rush. Has the ability to take over games. Had 8 tackles, 3 ½ tackles for loss, 2 ½ sacks, 2 batted passes and 1 blocked kick. Shayne Skov, ILB, Sr: Emotional leader of the defense. Leads the team in tackles. Closes quickly on the ball carrier. Having a better senior year after spending his junior year recovering from a knee injury as a sophomore. Has regained his explosion. Had 4 tackles. Dropped an interception. A.J. Tarpley, ILB, Jr: Versatile player that makes plays. Does a good job wrapping up the ball carrier. Good open field tackler. Stops the ball carrier in his tracks. Able to cover the tight end in pass coverage. Had 13 tackles and a pass breakup on 4th down. Jordan Richards, S, Jr: Plays well in the box. Good blitzer. Had 6 tackles and 1 QB hurry. Ed Reynolds, S, Jr: Ball hawk. Had 3 pick sixes in 2012. Good open field tackler. Had 4 tackles and 1 pass breakup on 4th down to seal the win. Sean Mannion, QB, Jr: 2011 Freshman All-American. Leading the country in yardage and touchdowns. Heisman Trophy candidate. NFL size. Pocket passer that isn’t a big running threat. Prior to this season he threw 31 TD and 31 INT, this year he has improved to 30 TD and only 3 INT. Willing to take the check down this year. Very accurate. Good anticipation and timing. Moves well in the pocket and eludes the rush well. Able to put the ball into tight windows. Takes hits and continues to compete. Completed 41/57 for 271 yards and 1 TD. Storm Woods, RB, RS Soph: Very good receiver. Excels on screens. Good burst through the hole. Follows blockers well. Had 8 carries for 21 yards and 4 catches for 15 yards. Terron Ward, RB, Jr: Small and quick. Able to start inside then bounce it outside. Great spin move out of tackles. Makes people miss in space. Good hands. Had 3 carries for 39 yards and had a 33 yard run. Had 5 catches for 33 yards. Brandin Cooks, WR, Jr: Leads the country in receptions, yards and touchdowns. Versatile. Great speed and quickness. Explosive and dynamic. Dangerous return man. Great moves in space. Sometimes jukes too much and needs to go north/south. Good on fly sweep. Has a nose for the end zone. Had 9 catches for 80 yards and 1 TD. Had 3 carries for 18 yards. Had a 41 yard punt return. Kevin Cummings, WR, Sr: Able to make a catch in a crowd. Willing to go over the middle and take a hit. Had 4 catches for 20 yards. Scott Crichton, DE, Jr: High motor. Disruptive. Relentless pass rusher. Moves around the line to take advantage of matchups. Good fundamentals. Good power move. Had 2 tackles, 1 tackle for loss, 1 sack and a fumble recovery that he returned 36 yards. Dylan Wynn, DE, Jr: Strong and quick. High motor. Relentless in pursuit. Can move inside on 3rd down. Had 5 tackles, ½ tackle for loss and a fumble recovery. D.J. Alexander, LB, Jr: Good speed and range. Had 5 tackles, 1 tackle for loss, 1 sack and 1 pass breakup. Steven Nelson, CB, Jr: JC transfer. First year at FBS level. Physical. Battles for the ball. Can sometimes get too physical resulting in penalties. This entry was posted on October 30, 2013 by draftmaniacs in Scouting reports and tagged 2014 NFL draft, Brandin Cooks, NFL, NFL Draft, Oregon State Beavers, Sean Mannion, Stanford Cardinal, Trent Murphy, Tyler Gaffney.